Every exercise plan begins with a single step. If you are extremely out of shape, focus on short-term goals so that you do not feel overwhelmed. The American Heart Association recommends that healthy adults do a minimum of 150 minutes of moderate cardiovascular activity every week, the equivalent of 30 minutes five days per week. In addition, you should spend a couple of 20-minute sessions per week doing strengthening and flexibility activities. 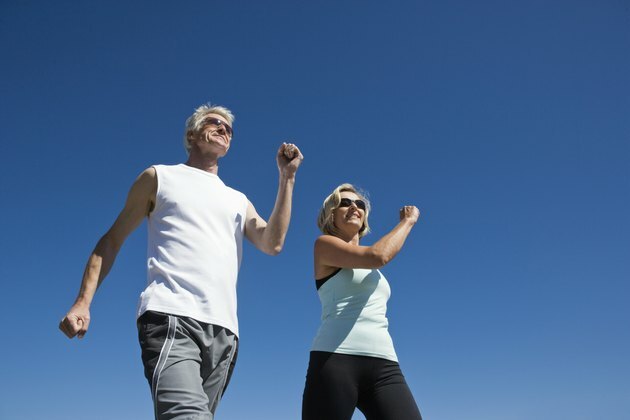 The simplest way to begin a fitness plan is to incorporate walking into your daily life. 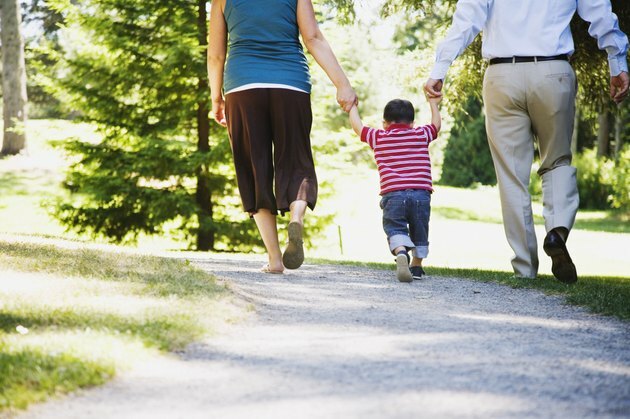 Set small goals such as parking further from where you work or taking an evening stroll around the neighborhood with family. Use a pedometer to measure the number of steps you walk. After a week, divide the total number of steps by the number of days you walked to get your average number of steps per workout. Spend the next week slowly adding to your number of steps so that the week totals another 1,000 steps. Your long-term goal should be to walk 10,000 steps per day. 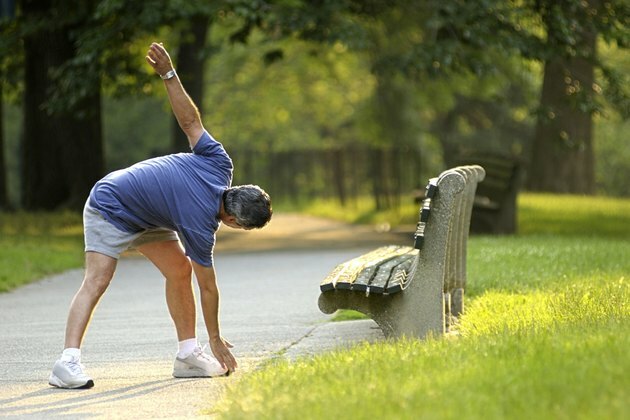 Before you stretch, warm up your muscles by marching in place for five minutes. You can do simple stretches such as raising your arms overhead and then bending over to touch your toes. Rotate various joints by circling your ankles and wrists, and twisting at the waist. Boost flexibility by doing some basic yoga poses. Once you feel ready, move through a series of yoga sun salutations, which also raises your heart rate. You do not need to pump iron to build muscle. 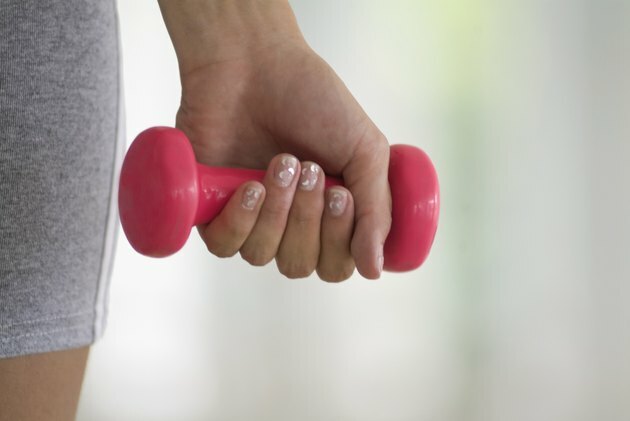 Some simple modifications to your cardiovascular workout can add a strengthening component. Strap light weights onto your wrists or hold hand weights and pump your arms as you work out. For more intense strengthening exercises, use your own body weight as resistance. Do pushups against the wall or try a series of squats and lunges. Work your shoulder and pectoral muscles by raising weights overhead and lowering them. As you gain fitness, slowly add to your workout schedule. Try a walking route that includes inclines, or vary your stride by raising your knees higher. Work on your core muscles by doing abdominal crunches. If you have a medical condition or an injury, consult with your doctor before starting a fitness regimen. How Many Calories Will I Burn Walking Briskly for 30 Minutes a Day 7 Days a Week?